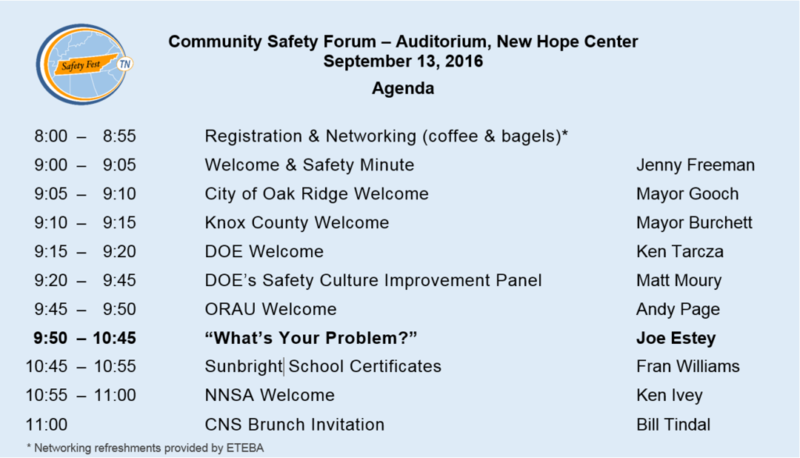 The official kick-off to Safety Fest TN, a Community Safety Forum will be held, Tuesday, September 13 at the New Hope Center Auditorium in Oak Ridge, TN. Registration and Networking start at 8:00 a.m. Like all Safety Fest TN classes, sessions and demonstrations, this forum is free and open to the public. A crowd is expected and registration is required to ensure there is enough space! Matt Moury is the DOE Associate Under Secretary for Environment, Health, Safety and Security. His presentation will center on the objectives and activities of DOE’s Safety Culture Improvement Panel. If your organization’s Safety Culture needs improvement, don’t miss this opportunity to learn about DOE’s initiatives for a safer work environment! 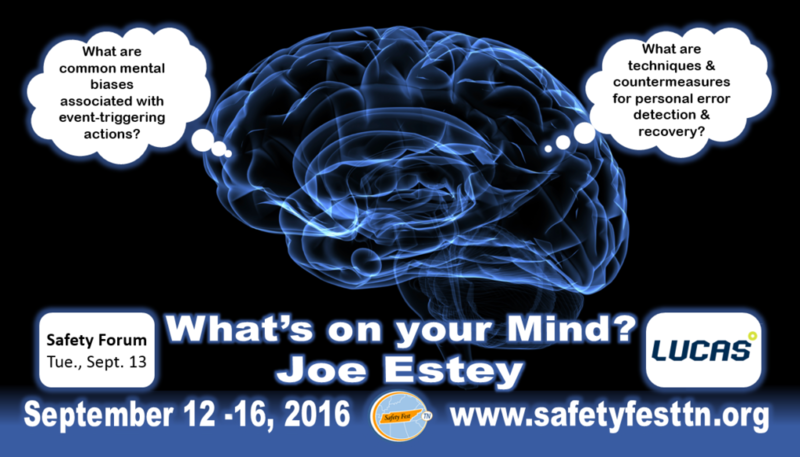 Joe Estey’s presentation, “What’s On Your Mind” will introduce us to common mental biases that lead to errors during busy, unplanned, dangerous or life-threatening events and he will provide us with techniques for improving error detection and personal performance during such events. After Joe, Fran Williams, URS | CH2M Oak Ridge LLC (UCOR) will make a few comments and then lead a very special segment. 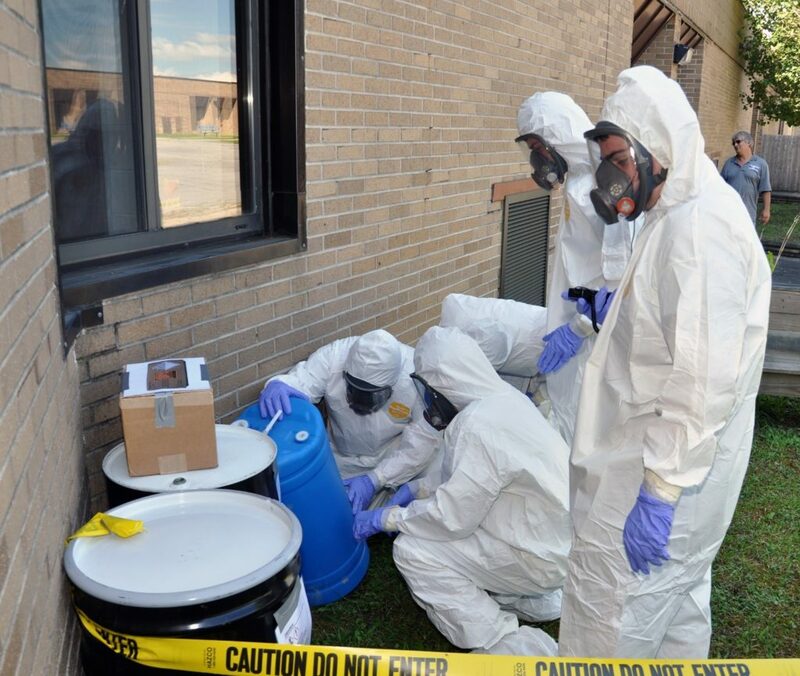 In a joint effort between the United Steel Workers, UCOR, and Safety Fest TN, 20 senior students from Sunbright School will receive certificates for 40-hour Hazardous Waste Operations Emergency Response training. Sunbright is a one-campus Pre-Kindergarten through 12 school located in rural Morgan County, TN. Bill Tindal, Consolidated Nuclear Security, LLC (CNS) will wrap things up and invite everyone in the Auditorium for the CNS Community Brunch. This will also coincide with the with the opening of the Safety Expo. The Community Safety Forum is free and open to the public. To register click here: REGISTER. Safety Fest TN will be held September 12 – 16. Many classes have filled up and have long wait list, if you are on a wait list now’s a good time to consider alternative classes. Go here for a direct link to the agenda: Agenda. Many classes will fill-up. Registration is Required.